Though Robins generally fly South for the winter, there are always some that stay up North. When my crab apple tree is full of fruit, they flock to it. Robins eat insects and fruit, but not seeds so the winter can be especially difficult for them. But when Springtime comes, they are already here and they are the first to claim the nesting spots! 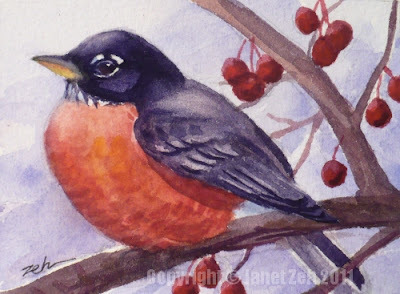 In this painting, a Robin sits in the crab apple tree against a snowy background. This painting is sold. 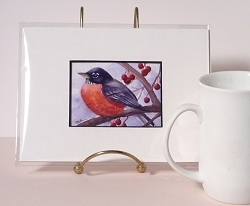 But you can see more of my bird paintings for sale in my Etsy shop, JanetZeh.Etsy.com. Thanks for stopping by today!